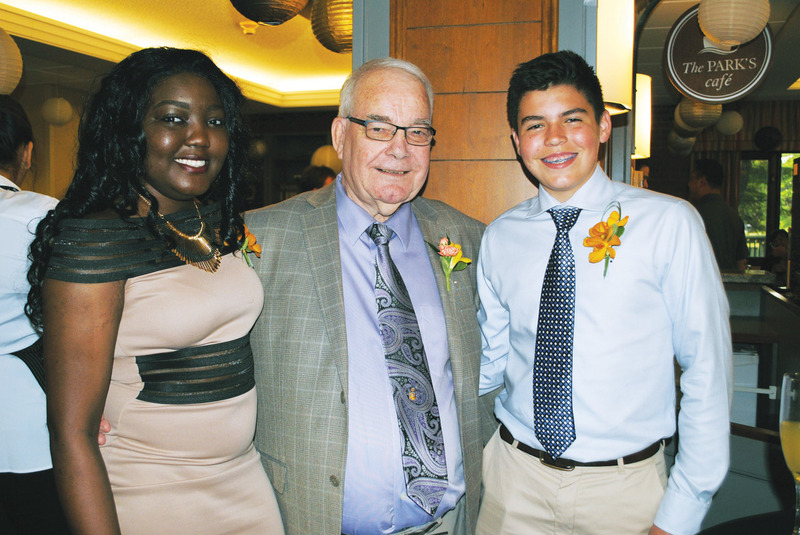 From left: Sarah Orayou, Paul Peel and Owen Lucier celebrate their film-making collaboration at Victoria Place Retirement Community at a premiere on June 4. It had all the trimmings of a Hollywood premiere - a red carpet, champagne, live music and paparazzi - but the movies here did more than just entertain. Victoria Place Retirement Community in Kitchener and Reel Youth, a non-profit film company, teamed up to link youth with seniors in the community through storytelling and film-making. A gala of the films was shown June 4. When Revera, which operates retirement communities across Canada, heard of this group, they thought they would be a good link with seniors. So far, there have been six film-making events with Reel Youth and Revera retirement homes across Canada. “The lack of connection through people of different generations creates barriers,” said Revera CEO Stephen Foster at the premiere. Twelve youth from Waterloo Region teamed up with 11 residents from Victoria Place Retirement Community, and the results were funny, tender, and inspiring. The four minute films were shown at the retirement residence on June 4 to friends and family to help celebrate Seniors Month. They told stories of love, loss, perserverence, bravery, dedication and generosity. But most of the time, the films made the audience laugh. Rudy Adam says he met his wife Elizabeth in a club where she was working. Both are 84. “I’m still suffering from that day,” he jokes, and Elizabeth responds to his jest by sitting on his lap. Their recipe for a good married life? Work together and love each other. Sheila Adeney told an inspiring story of heading out to travel Europe in 1951 with a group of girls following high school. While it may not sound unusual to today’s youth, it was so unheard of for girls in that era that the Globe and Mail did a story about it. August Gossmann told his story of joining the German marine corps to avoid being forced to join the Nazi SS police force, and the difficulties of surviving in war time. He goes on to talk about the joys of travelling after the war on a motorcycle. “And if you have a wife with you that is scared, it makes it more fun yet,” he said with a smile. Gossmann passed away before the film premiere, but his film means his story will remain. Paul Peel, 80, told the story of how losing his hand in a boating accident at 19 made him appreciate life more. Peel was pulling a swimmer who was having difficulty back to shore on Lake Scugog. A rescue boat accidently drove over them rather than turning off the propeller. The swimmer was left with a few marks on his head but was otherwise uninjured, but Peel lost his hand. “I know I laughed a lot more afterwords, which may seem crazy, but it’s really what happened. I just appreciated things more,” he said. He went on to study at the University of Guelph and held a number of jobs in his life, several in the agricultural industry. At the premiere, Peel said he enjoyed working with his film team of Owen Lucier and Sarah Orayou. “They did the filming, editing and visited quite a bit before they started filming,” he said. Orayou is a student at St. Mary’s High School in Kitchener. She was already doing a co-op term at Victoria Place when she heard of this project. “I thought it would be a great opportunity to get to know the residents better,” she said. Lucier heard about Reel Youth from a teacher at school who knew he had an interest in film-making. The whole project was done quite quickly. The youth received two days training on filming and editing from Reel Youth, and then spent two more days filming the residents. Once they had their film, they spent two days at Victoria Place using the computers and software to make their films. The films are part of Revera’s social cause called Age is More. To see all the Revera and Reel Youth films, including those from Victoria Place, visit Age Is More website.